Ramey is a small borough, which lies between Woodward and Gulich townships, midway between Houtzdale and Janesville. It bears the name of David K. Ramey, an Altoona businessman, who engaged in extensive logging and coal mining operations in and around the town. The existing village was incorporated as a borough in 1893. 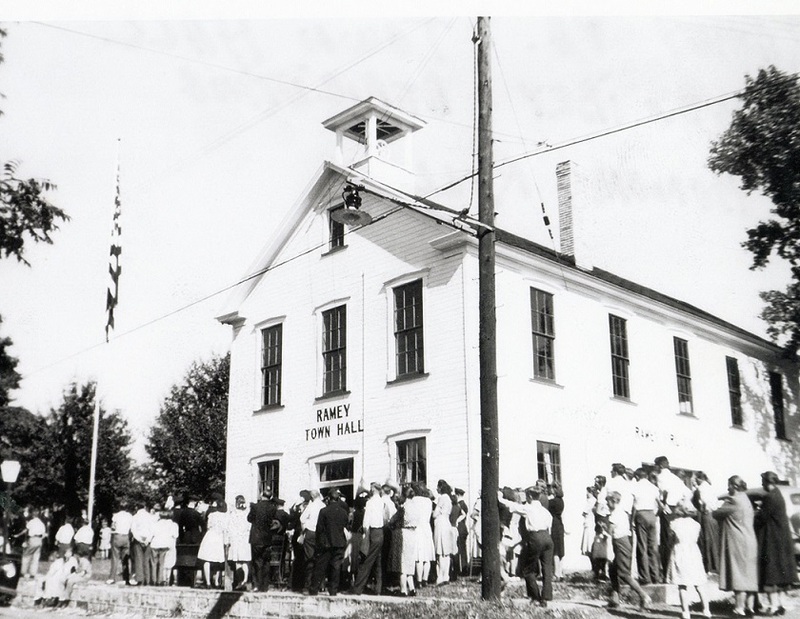 The town hall, built in 1912, stands today and is where Ramey’s Borough Council still has its monthly meetings. The photo shows locals gathered on the narrow sidewalk space, perhaps sometime in the late 1940’s or 1950’s. A uniformed band, perhaps made up of firemen, is shown playing in the background, in the bottom left corner of the photo. It is likely a Memorial Day commemoration as the leaves are fully out on the trees.